Our legacy of success is a testament to our commitment of being the torchbearers of quality education in the region. The benchmarks set by us are unprecedented and this class leading act has gained recognition and appreciation from all quarters of the education and corporate community. We do not rest on our laurels but strive to rise higher and higher, because sometimes, even sky is not the limit. Best Management Institute of U.P. Uttam Institute chairman Mr. Sanjeev Kumar Singh receiving the award of 'Best Management Institute of U.P. by Mr. Sandeep Jajodia (Chairman ), the Associated Chambers of Commerce and Industry of India (ASSOCHAM) & Mr.D. S. Rawat Secretary General ASSOCHAM in10th ASSOCHAM HIGHER EDUCATION SUMMIT & NATIONAL EXCELLENCE AWARDS-2017. The remarkable feature was the presence of hnbl' Union Minister of HRD Shri Prakash javdekar as chief guest of the function. Excellence that leaves an impression which standardizes a service or contribution to an extent that it deserves to get recognition, fame and position in our social, professional and competitive environment. 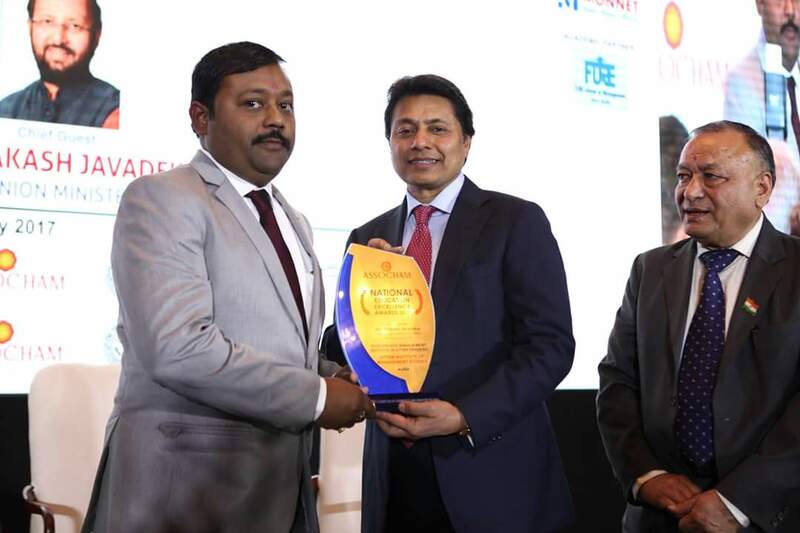 ASSOCHAM presented National Education Excellence Awards to Uttam Institute for contributing significantly in the field of improving the quality in education, delivery mechanism with emphasis on world-class research and innovations in enhancing the development of quality education, with employability. Symbol of recognition - for the valuable contribution and excellent innovation by education institutions and service providers across the nation, thus setting a landmark in the education industry. A big thanks to those who have contributed directly or indirectly to this success of Uttam Institutions and be the witness to this proud moment. A practical workshop on Importance of Food Processing and Export Potential of Food Products in India for students of B.Sc. Bio-Tech. from 19-3-18 to 21-3-18. Timings. 10.30 A.M. to 2.30 P.M.
A practical workshop on virtual stock market by a trainer from ICICI Direct for students of Management on 17-3-18. Timings. 10.30 A.M. to 2.30 A.M.
A pool campus drive at UGI campus on 14-3-18 @ 9.30 A.M. onwards. Details. REINHEIT: Sales Representative at Reinheit Organic Foods 1. HR Round, Sales Manager Round & Last Round will be with Managing Director. 2. CTC-Annually 2,18,000 (2 LPA base salary+18,000 travel allowance)+ performance based incentives. 3. Joining Date- Immediate. Vodafone: Customer Service Executive â€“ Retail â€“ Stores. Eligibility- Minimum academic qualification Graduate in any stream or an equivalent academic qualification. Working knowledge on computers/ laptops/ Handsets/ Dongles/ Value Added Services. Accenture: Accounts Profile. Location: Gurgaon & Noida. Qualification: Minimum academic qualification Graduate in any stream preferably Commerce- B.Com. or B.B.A. or an equivalent. Salary: Upto 23000 + cab + Mediclaim. Holi celebrations at UGI Campus on 2-3-18 from 9.00 A.M. to 2 P.M.
Students are directed to clear all their dues failing in doing so will make them ineligible to appear in Internal Exams. Internal Exams are starting from 26-2-18. For details please refer to the Notice Board.